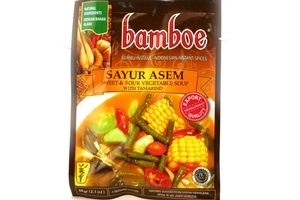 Bamboe Sweet & Sour Vegetable Soup With Tamarind (Bumbu Instan Sayur Asem) in 2.1oz (60g) sachet. Sayur asem or sayur asam is a popular Indonesian tamarind dish. Common ingredients are peanuts, young jackfruit, melinjo, bilimbi, chayote, long beans, all cooked in tamarind-based soups and sometimes enriched with beef stock. Quite often, the recipe also includes corn. The origin of the dish can be traced to Sundanese people of West Java, Banten and Jakarta region. It is well-known belongs within Sundanese cuisine and Betawi daily diet. Shallots, garlic, chili, galangal, tamarind, salt, vegetable oil, sugar.